2. Place the bacon onto the rack and don’t let the pieces touch. Use a spoon to add brown sugar to some pieces, and press down with the spoon to flatten the sugar. Leave some pieces plain for the chocolate. Baste a few pieces with maple syrup. 4. 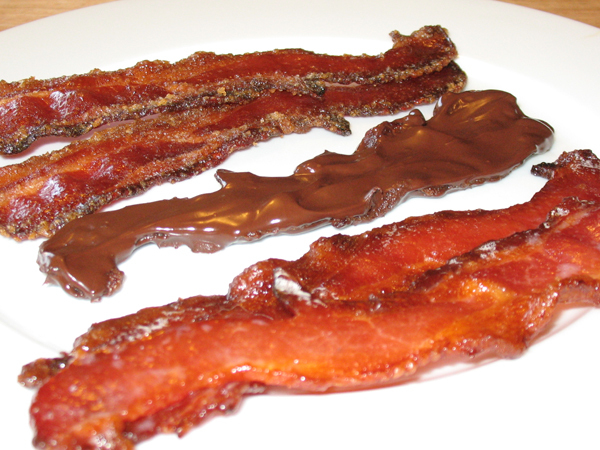 Once the bacon has cooled, melt the chocolate and use a spoon to coat one side of the plain strips. Let it sit to harden. Once it’s hard enough to your liking, pick it up by the edges, flip, and apply chocolate to the other side. (Re-heat the chocolate for this part.) Let it harden again before eating.